Zeke reflects on his childhood with Jedidiah. Zeke finds a “Vote for Throne” sign in front of his house that sends him into a rage. He tries to confront Jedidiah about it, but he doesn’t get the chance. Meanwhile, Jedidiah is helping a woman with a nose graft. Mae meats an old woman named Mo selling wild mint. Zeke’s kids are having a hard time at their new school. Later, after coming up short on his job search, Zeke sees on of Jedidiah’s employees being hassled by a pair of large men in suits. Farmhand #2 continues its by trying to show what life is like for our lead characters in Freetown. Consequently, it’s a little meandering, with a lot of lulls. The comic tries to fill some of these voids with some comedy and even a little slapstick. How well that works for you will vary. I was left a little bored. We don’t learn a lot more about Jedidiah’s farm or their inner workings beyond a stinger at the end of the book. We meet one particularly badass character named Pastor Tree Moore. He knows Zeke and Jedidiah well and beats the tar out of someone with a Bible. Beyond that, this comic didn’t do much for me in terms of story. 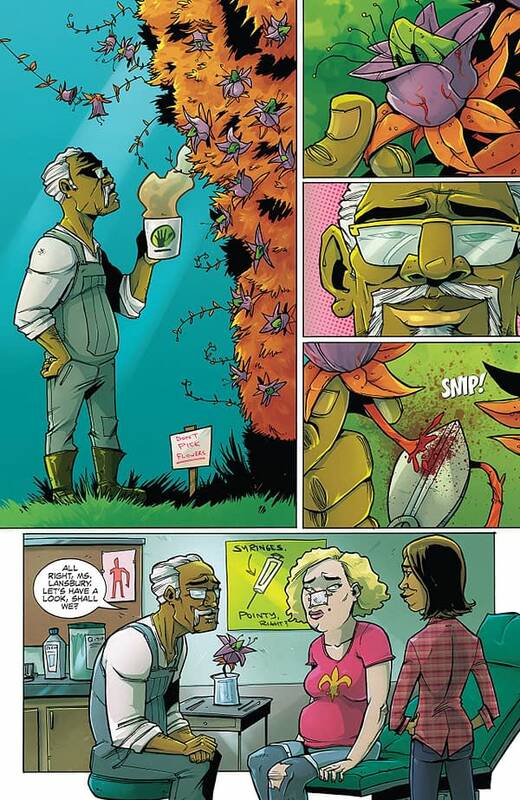 Rob Guillory’s artwork is still cartoonish and over-the-top, and that certainly offers its charms. It doesn’t work when the comic tries to convey anything subtle, like a character looking suspicious—which happens and is really drilled into the reader’s head. I still dig the visual creativity behind Jedidiah’s plant. The color work of Taylor Wells works well though, giving book a near-blinding amount of color that adds a lot of personality to Farmhand. 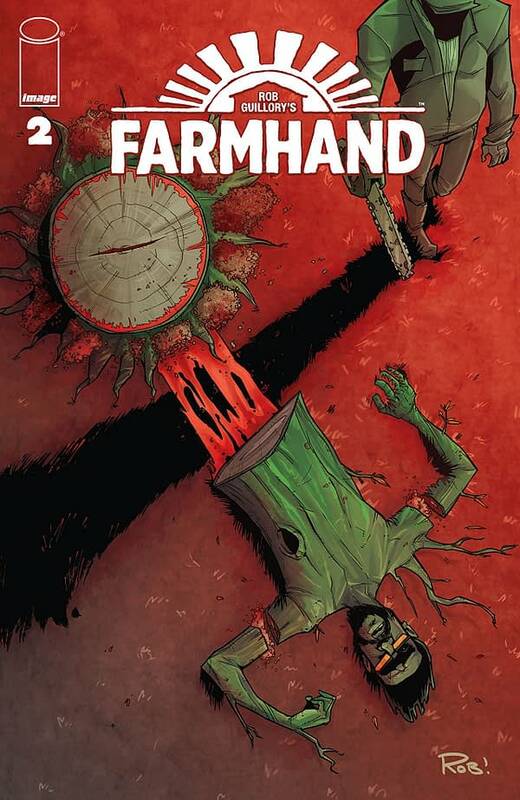 Farmhand #2 is far lighter on intrigue than its predecessor. It doesn’t have a lot in the way of character development either. That leaves the book little beyond some decent world-building and a Father Moore beating the tar out of a pair of henchmen. It’s not awful, but I can’t quite recommend it either. That said, if you loved the first issue, you will probably enjoy this one too.